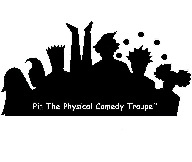 Pi is a physical comedy troupe devoted to exploring the world and examining life’s mysteries through a lens of wonder. Six clowns currently comprise the ensemble Pi, which was founded at the University of California at Santa Cruz in 2004. As a troupe, Pi creates theater using elements of clowning and mime technique, acrobatics, juggling, eccentric dance, live music, improvisation, puppetry and feats of incredible strength. Most of their work consists of short clown vignettes. Their storytelling relies mainly on the physical virtuosity of their bodies, although they do use speech when necessary. The spectator is fundamental to their clowning and plays a vital role in making every performance unique.